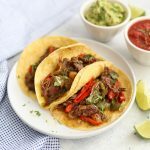 Slow Cooker Beef Carnitas – Tender, slow cooked beef just begging to make the best tacos or burrito bowls you’ve ever eaten. Gluten free & paleo friendly! Post updated Oct 2017. Originally posted June 2013. First off: I know. These are NOT authentic. 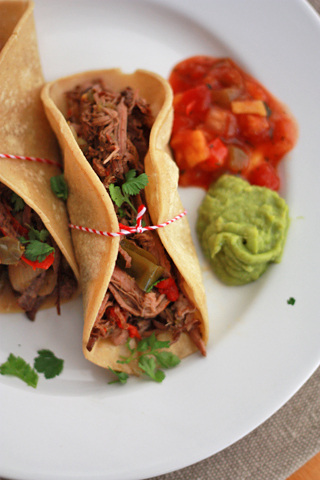 Carnitas are traditionally made with pork braised in oil or lard until tender. I skip the oil/lard, and swap pork for beef. I couldn’t say no to our taco craving! Tacos are a major favorite at our house, but I have to admit that I’m not usually satisfied with a ground beef taco. It feels like the peanut-butter-and-grape-jelly-on-Wonder-bread of tacos. They get the job done, but I always feel like there’s something I could do better, add more flavor, or make them more exciting. d beef tacos will probably be Michael’s forever favorite. I don’t always have time to babysit braising meat, I love turning to my slow cooker for situations like these. 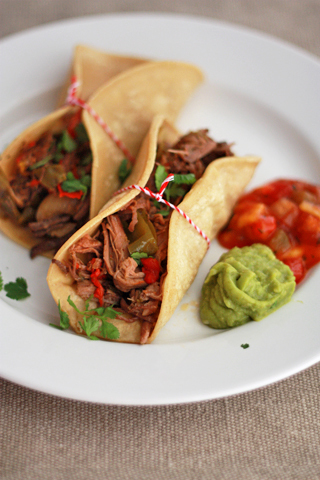 Enter: Slow Cooker Beef Carnitas! These were a cinch to pull together. I pop everything into the slow cooker, forget about it for a few hours, and then give it a quick shred with tongs (it’s fall-apart tender!). You could certainly dress them up with shredded lettuce, tomatoes, cheese, sour cream, etc. 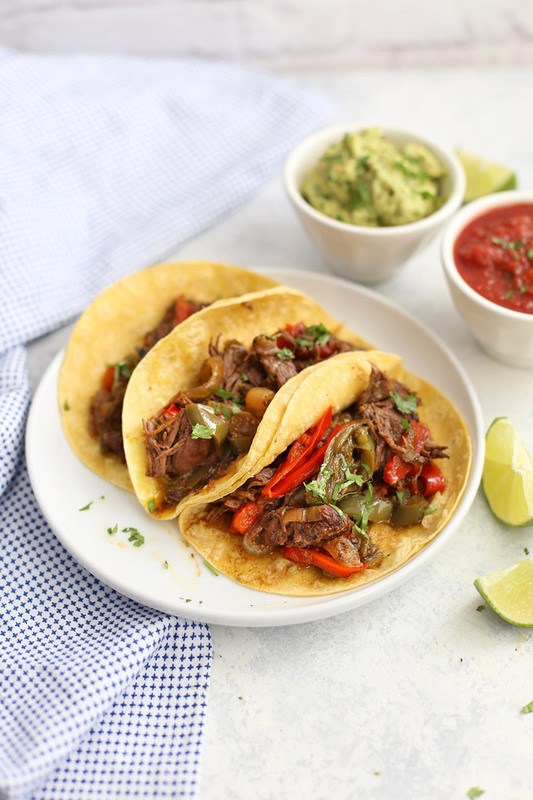 I think the meat and veggies mixtures is so flavorful these don’t need much more than a tortilla and a little salsa or guacamole (because EVERYTHING is better with guacamole). I’ll also say that as much as we love these as tacos, the beef is equally delicious in burrito bowls (with these sweet potatoes), rice bowls, taco salads, or tucked into baked sweet potatoes. Make Ahead Notes: To save time in the morning, I often do the prep for this meal at night. I slice up the veggies, brown the beef, put everything into the slow cooker crock, and refrigerated it in the crock overnight. The next morning, I pulled out the crock, settle it into the slow cooker and forget about it till many hours later. 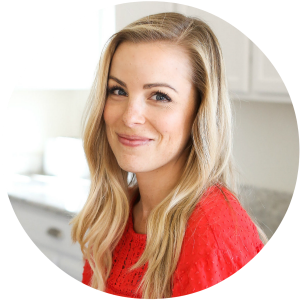 My FAVORITE Slow Cooker: I always get questions about slow cookers when I post a slow cooker recipe. I swear by this one. It’s programmable, has a lid clip (no more sloshing if you need to transport it), and even has a thermometer you can program so that your slow cooker switches to WARM mode when the meat reaches the right temperature (which means NO overcooked, dried out meat–Holla!). Target and Amazon typically have the best prices. PALEO Notes: if you’re eating paleo or doing a Whole30, this beef recipe is 100% paleo approved. Instead of serving it in tacos, make a giant taco salad heaped high with salsa and guacamole, stuff a baked sweet potato, or serve it in burrito bowls (with these sweet potatoes!) and your favorite taco toppings. If your slow-cooker has a removable crock, you can prep this the night before. Follow all steps up until cooking and refrigerate overnight. The next morning, put the crock in the slow cooker, set it to low, and you’re ready to go! If desired, brown your beef roast in a pan or Dutch oven. Heat a small drizzle of oil over medium heat, add the beef roast and cook 5-7 minutes per side, or until it’s very browned and crisped. Place roast in the slow cooker. In a small bowl, whisk together chili powder, salt, pepper, cumin, smoked paprika, garlic powder, and onion powder. Sprinkle spice mixture over the roast. Add onion, bell peppers, and green chiles over the roast as well. Cook on HIGH 3-4 hours or LOW 7-8 hours, or until beef is pull-apart tender. (You should be able to easily shred it with a fork or a pair of tongs). 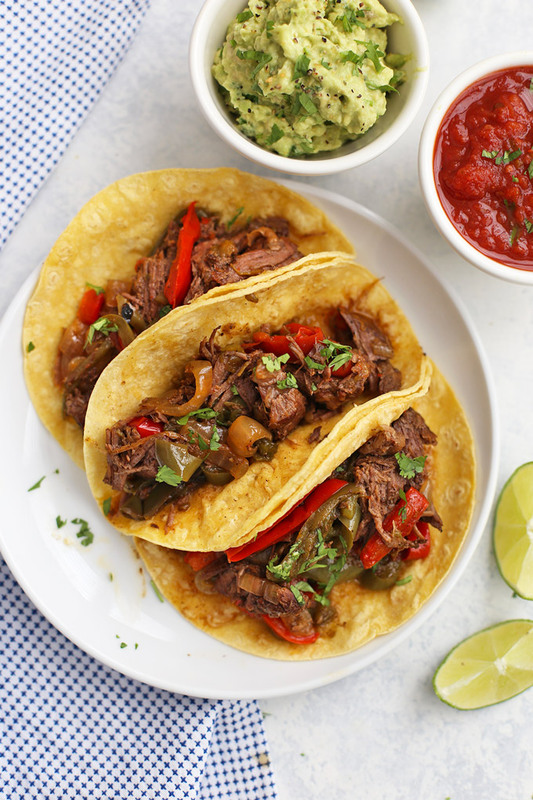 *Gluten & Dairy Free Notes: not all corn tortillas are gluten free. Read your package to be sure. We like Tortilla Land cook-your-own corn tortillas. They’re gluten and dairy free and are delicious and soft (i.e. they don’t crack or split when you bend them). Also, this is common sense, but skip cheese and sour cream if you’re dairy free. 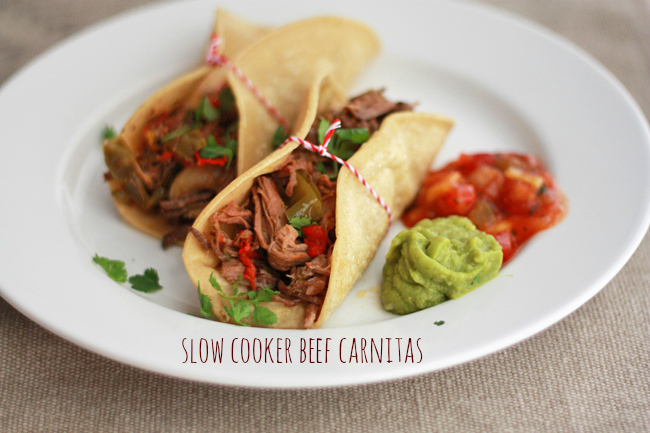 These look so tasty, and it’s great that they’re made with affordable, yet oh so tasty when slow cooked, chuck! My mouth is watering. We love taco’s but hate ground beef. Thank you for a wonderful alternative! Can I add these to the Hootenanny menu?? Please? Also, Emily–where do you find the tortillas? I’m guessing cold food section? Elisabeth all bread items are in the bread isle ! The type of tortillas she mention have to be refriderated. They are normally in the deli section depending on the store. Yes they are in the regular cooler section at Meijer’s they are called Aztec Torila shells, krogers they are in the regular aisle but a cooler section. These were fantastic and easy since I keep bell pepper strips frozen in my freezer. It took only a few seconds to throw together and made a TON. These were a huge hit with my family! Than you for sharing this great recipe. I didn’t marinate overnight but decided to sear the seasoned meat first, worked well, crockpotted it all day. My house still smells yummy the morning after! We made these tonight and everyone loved them! The meat had just the right amount of seasoning to add flavor without taking away from all my other favorites (avocados, cilantro, sour cream, etc..) Thanks for sharing! Emily we love this recipe. We have made it multiple times since you posted it and it has become an instant staple in our house. I’m featuring it on my fabulous friday post tomorrow just to give you a heads up. Miss you girl and keep the great recipes coming! These were so yummy! Made these for dinner tonight and the hubby and I both loved them! I’m so glad you liked them! They’re my husband’s absolute favorite meal. Do you add any water? Can’t wait to make these! I don’t! The meat creates its own juices and is tender and delicious without it! Nanci – Absolutely! Since the meat is in smaller pieces, you may just want to check it 1-2 hours earlier. It will probably be tender sooner. Yum! Hope you love them! Instead of cooking it on low, could I cook it on high for a shorter amount of time? Any idea how long that might be if I cook it on high? Tania – That should be just fine! When switching from low to high, I generally half the time, so I’d say 3-4 hours on high should do the job. Just so long as the meat shreds easily, you’ll know they’re done! I have now made this several times. My family begs for them which is just fine with me. We love them and it is really easy to make. Thank you for the recipe and also the tip about the corn tortillas-I will never go back to the ones I used to use. ANA – I’m so glad! Thank you for the kind comment and great feedback. Happy eating! You don’t put any liquid at all in the crock pot? Karen – I don’t. In all the times I’ve made this, the beef releases it’s own liquid shortly into the cooking process, and it’s enough to keep everything from burning. If you’re nervous, you could put a little beef stock or water in, but I wouldn’t add more than about 1/2 cup at the very most. So the ingredients calls for a chuck k roast but directions reference a rump roast. Have you tried this with a rump roast? I’m just a bit worried it’ll be too lean. JJ – I’m sorry for the confusion! I’ve updated the directions to say chuck roast. I’ve used both kinds of roast with good results, though I most often use a chuck roast since the price is typically better at my markets. I hope that helps! Have a great day! Do you add any liquid? Tracy – I don’t. I’ve never had a problem with scorching. Typically the juices from the beef are plenty to keep everything nice and cozy! I hope that helps! I am making this as we speak. The smell is so delightful I can’t wait to sink my teeth into this. Thanks for such a tasty recipe. Mia – Oh, you made my day! I hope they tasted as good as they smelled! would it be reasonable to save the juice (the water released by the meat) to use as, say, a salad dressing? (I ask because I know you’re not supposed to reuse chicken marinade.) if so, would it need to be stored in the refrigerator? S – you could certainly repurpose the juice from the cooked meat if you like. Mine has never tuned out overly juicy since there’s no added liquid.I’ve always just eaten it as part of my carnitas. You would absolutely want to refrigerate it and it will only keep for about 5-7 days max. Making this right now and totally love u for this recipe ! Me and my hubby just moved in together and he wanted this to be his first meal !!!! Oh congratulations! I hope you love it as much as we do! YUM! These are totally going onto the menu plan next week! I made this with venison instead of beef and it was delicious! Wow! That’s great to hear! So glad you liked it! Making today for the 2nd time..love them. Cooked it on low it was perfect. Yay! I’m so glad you loved it! These are one of my husband’s FAVORITES! Hi. Would flank steak work for this recipe? Marley – I haven’t tried it with flank steak, but I think it would be overcooked in a slow cooker. It doesn’t have as much connective tissue to break down as a beef roast. I wouldn’t recommend it. I made this last Monday with a grass-fed chuck roast. It was sooooo good and my boys loved it so much I made it again today with a grass-fed rump roast. I cant decide which was better! Thanks for sharing! I love hearing this!!! So glad you enjoyed it as much as we do! I think so! I haven’t tested it, but would guess you’d cook it about 45 minutes at pressure. That’s about how long I’ve cooked other beef roasts with good success! Would a tri tip work well for this dish? Tri tip steak? Or a tri tip roast? I wouldn’t recommend a steak for sure, since the slow cooking would probably just cook it to death. If you’re talking about a roast, the cattlemen’s beef board says it’s good for roasting, so it might be able to stand up to the longer cook time of a slow cooker! Just a quick question. Just the roast in the pot no additional liquid? Yes! The meat and veggies will create all their own juices. I’ve never yet had any problem with scorching, burning, etc. We raise our own beef and thinking of using stew meat. Don’t think I will have any issue do you? The spice mix is what puts this recipie over the top. I cooked roast in my crock pot on low for 7-8 hours. We have been using the meat for street tacos alll week. So good and easy. I LOVE hearing that!!! Thank you so much for sharing.